Gerontology is the study of aging. It comes from the Greek words geron, meaning “old man”, and -ology, a suffix meaning “the study of”. Gerontology is a multidisciplinary field. It involves the scientific study of physical, mental, and social changes that occur in older people, the investigation of societal changes from an economic, historical, and philosophical standpoint, and the carrying out of policies and procedures to aid older people with information from gerontology in mind. Gerontologists in the field of biology study the biological changes that occur in older individuals. Gerontology is not to be confused with geriatrics, which specifically refers to the medical care and treatment of older people. People have been fascinated with aging since ancient times. Of course, many ancient cultures, much like today’s society, were highly interested in slowing the aging process or reversing it. The earliest known recipe for an anti-aging ointment is from an Egyptian papyrus dating back to 2800-2700 B.C. called “The Book for Transforming an Old Man into a Youth of Twenty”. It claimed to beautify the skin and remove any disfiguring signs of age. Another ancient papyrus from 1550 B.C. describes some of the biological changes that can occur with aging, such as heart pain, deafness, blindness, and what would later be known as cancer. Gerontology research, and other forms of scientific research, really took off during the 19th Century, when the use of the compound microscope became widespread. Many scientists at first began to study bacteria under the microscope in order to study senescence, or aging, but this proved difficult because bacteria reproduce by dividing themselves into two cells and do not become senescent in the way that the cells of multicellular organisms do. Multicellular animal models had to be used instead, and this is one reason why the use of mice became so ubiquitous in research. With the use of the microscope, scientific knowledge advanced a great deal. For the first time, researchers could examine the processes of aging at the cellular level, and really begin to understand the specific changes that take place in the cells of older people. People began to develop theories about why aging occurs; August Weissman, a German embryologist, proposed that lifespan was related to an evolutionary selective advantage, and that species with different body sizes, intelligence, and ecology had different lifespans. The term gerontology was coined in 1903 by Élie Metchnikoff, a Russian zoologist who did immunology research and won the Nobel Prize in Physiology or Medicine for his work. In the mid-20th century when the structure of DNA was uncovered, another paradigm shift occurred in gerontology research. Scientists could now study genetics relating to aging; for example, they looked at unique mutations in abnormally long-lived or short-lived fruit flies. Other ways of extending an organism’s lifespan were also found, like putting mice on calorie-restricted diets or putting fruit flies in very small cages so that they couldn’t fly as much. Further progress was made when age-related decline in certain hormones, like growth hormone, thyroid hormone, and estrogen, was discovered. More recently, genome sequencing has been used to identify genes associated with aging. Many changes occur during normal aging. Genetics and lifestyle both play a role in signs of aging exhibited by the body. Skin becomes dryer and less elastic, leading to lines and wrinkles. Hair thins, and gray hair increases. High-pitched sounds become harder to hear, and vision declines; most people need reading glasses when they’re in their 40s. Changes in sleep patterns also occur, with older people generally needing less sleep and waking up more during the night. Bones may become less dense, height decreases, metabolism slows, and blood flow to the brain decreases. Sexual functioning also decreases. Men produce fewer sperm, and women go through menopause and stop ovulating (and menstruating), which means that they can no longer get pregnant. All of these changes are found to some extent in older people, but the choices a person makes—such as eating healthy and exercising—can help moderate the effects of aging. In individual cells, senescence occurs when a cell can no longer divide. Cells at first divide quickly, then more slowly, until eventually mitosis stops. The size and shape of the cells changes, and debris accumulates inside them. In addition, genetic damage can accumulate in cells over time through exposure to sunlight and radiation, and through free radicals that are cell by-products. Telomeres, which are regions of DNA at the end of a chromosome, are ultimately responsible for the stopping of mitosis. Telomeres shorten with each cell division, and over time when they become very short, the cell can no longer divide. People in many different disciplines can be gerontologists if they focus on issues related to aging. Biologists, sociologists, and psychologists are the main professionals that focus on gerontology, but others such as those who study economics, politics, and public policy are sometimes also gerontologists. Yet other gerontologists may be trained in nursing, physiology, nutrition, or pharmacy. Gerontologists study issues related to the aging process itself; doctors who specialize in the care of aged people are in the related field of geriatrics, and are called geriatricians. Note that a doctor may be both a geriatrician and a gerontologist, if they specialize in treating elderly patients and also carry out research related to aging. Since people from very different disciplines can be gerontologists, gerontologists have a variety of job descriptions. Some gerontologists do research in laboratories, and are therefore called research gerontologists. They may research changes to body structures that occur during aging. Applied gerontologists work directly with older people and their families, analyzing their interactions and communicating with them in order to better understand the living environments of aging people. Other gerontologists are administrative gerontologists, which develop and run programs and services that help enrich and improve people’s lives. No matter what your specific career interests are, if you are interested in helping elderly people and understanding aging, you can become a gerontologist. 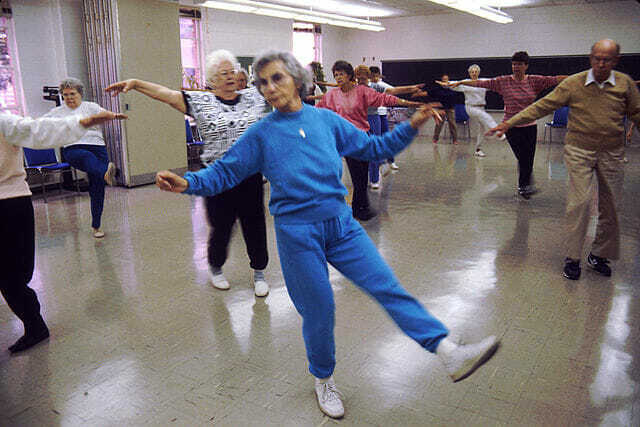 These elderly people are attending an aerobics class. Gerontology research has shown that exercise can help combat negative bodily changes associated with aging. n.a. (n.d.) “Gerontology/Geriatrics Definitions.” Association for Gerontology in Higher Education. Retrieved 2017-04-18 from https://www.aghe.org/resources/gerontology-geriatrics-descriptions. n.a. (n.d.). “Healthy Aging – Normal Aging.” WebMD. Retrieved 2017-04-19 from http://www.webmd.com/healthy-aging/tc/healthy-aging-normal-aging#1. n.a. (n.d.) “The History of Gerontology (Aging).” what-when-how. Retrieved 2017-04-19 from http://what-when-how.com/aging/the-history-of-gerontology-aging/. n.a. (n.d.) “What is Gerontology?” University of Georgia Institute of Gerontology. Retrieved 2017-04-19 from https://www.publichealth.uga.edu/geron/what-is. n.a. (2002). “Gerontology.” Encyclopedia.com. Retrieved 2017-04-19 from http://www.encyclopedia.com/medicine/divisions-diagnostics-and-procedures/medicine/gerontology. n.a. (2017). “Cellular Aging: Basic Phenomena – Changes in Cell Morphology and Contact, Senescence and Cell-Cycle Progression, Growth Signals and Senescence.” Net Industries. Retrieved 2017-04-19 from http://medicine.jrank.org/pages/266/Cellular-Aging-Basic-Phenomena.html. n.a. (2017-04-19). “What is a Gerontologist”. Virginia Commonwealth University School of Applied Health Professions. Retrieved 2017-04-19 from http://www.sahp.vcu.edu/departments/gerontology/about-us/what-is-a-gerontologist/. Besdine, Richard W. (n.d.). “Changes in the Body with Aging.” Merck Manuals. Retrieved 2017-04-19 from https://www.merckmanuals.com/home/older-people%E2%80%99s-health-issues/the-aging-body/changes-in-the-body-with-aging. Harper, Douglas (2017). “Gerontology.” Online Etymology Dictionary. Retrieved 2017-04-18 from http://www.etymonline.com/index.php?term=gerontology. Williams, Mark E. (2017-03-22). “Growing Old in Ancient Cultures.” Psychology Today. Retrieved 2017-04-18 from https://www.psychologytoday.com/blog/the-art-and-science-aging-well/201703/growing-old-in-ancient-cultures.